﻿ Fouling in RO Membrane reduced using the unique Merus treatment. In many parts of the world it is difficult to get access to clean drinking water. Even bore well water needs a lot of treatment before you can drink it unhesitatingly. One reason is the over use of the bore well water. One have to go deeper and deeper to find water and the water holds more and more TDS. Often reverse osmosis systems (RO) are used to filter foreign substances out of the raw water and gain drinking water. 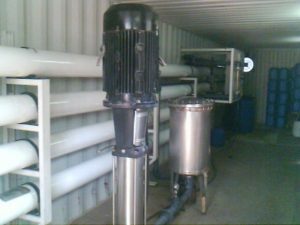 In Saudia Arabia our customer runs several RO systems to produce clean water. reign substances (Total Dissolved Solids TDS) in the well water results in problems at the membranes of the RO. The solved minerals in the water can only partly be flushed out with the retentate. Some of them gets caught in the membrane, blocks the pre-filters and causes fouling. In order to maintain the production volume needed, the pressure at the membrane is increased day by day. Whereas the production capacity still declines. Every three months the RO membranes needed to be exchanged. The pre filter in front of the RO system needed to be exchanged once a week. Additionally different kinds of chemical additives are used to enhance the life time of the membranes. As a result the fouling grows slower but is not stopped. As a trial, we installed Merus Rings at the RO system. It was choosen the systen most severely affected by fouling. Right after the installation the monitoring showed that the production volume didn’t decrease anymore. After some weeks of stable results, we decided to stop adding chemicals to the RO. One year after the installation there was still no fouling at RO treated with Merus Rings. The customer decide to equip all RO systems with Merus Rings. Two months after the installation the investment was amortized. The prefilter last far longer, the membrane have only to be replaced once a year, and no chemicals were added anymore. Furthermore the production runs stable without down times due to an exchange of membranes. Due to the clean system, also energy savings were achieved, as the pumps don’t need full power anymore.